A must have when adding electrical accessories. These Fuse Blocks connects to your Battery Positive Terminal. 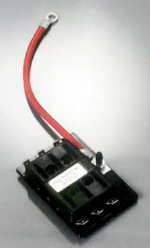 This will give you four or six additional separately fused circuits. 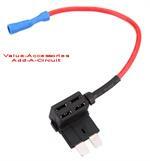 Uses Standard ATC Plug-in Fuses. Includes Heavy Gauge Wire to hook up to your Positive Terminal of your Battery with an Insulator for the Block Positive Terminal. Also included is a combination of Blue and Red Female Disconnects to hook up the the Fuse Block. Blue is for 14 - 16 Gauge wire (most common) and Red is for 18-22 gauge wire. You only need to supply your own 1/4" Blade terminals and wire. We suggest 16 or 18 Gauge wire for supplying most of your loads hooked up to the Fuse Blocks. 6 Position Size: 3/4" x 2 1/2" x 3 1/4". Included 14" Long #10 battery hook-up wire. 4 Position Size: 3/4" x 1 3/4" x 3 1/4". Included 14" Long #10 battery hook-up wire. Click here for Installation Instructions that we have put together for the Accessory Fuse Blocks. 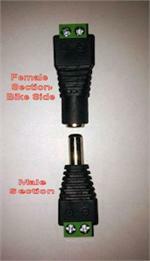 Shown below the 6 Position Fuse Block installed on one of our own bikes. Installed in the original tool box.